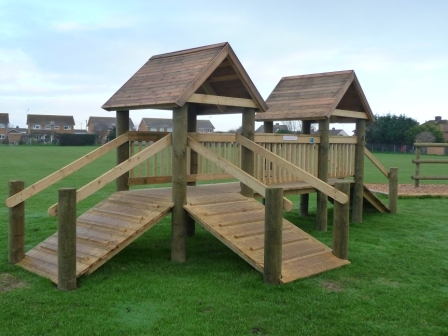 We have recently been asked by a couple of Primary Schools if we can build play equipment that conforms to British Standards but does not cost a small fortune. Well in short the answer is…Yes of course we can! Schools budgets are getting ever tighter and public money needs to go further and further these days. That’s where Arbworx comes in. As usual we researched the products out there and looked at what could be built for the restricted budget that the schools had. Certain items that cost more than others were slides and features with an increased critical fall height. All these would need safety flooring to compensate for the additional height and so we soon realised that savings could be made if we lowered the construction height to remove the need for the flooring. Other areas of savings could also be made if specialist mouldings and fabricated structures could be avoided. So out with the bright coloured plastic slide and fireman’s pole and in with the timber ramp and climbing bars. Kids imaginations are amazing things and just because its not a bright flashing structure or its a stainless steel pole does not mean that it isn’t a pirate ship sailing the high seas. At primary school age its all about the imagination and where the kids go with it. 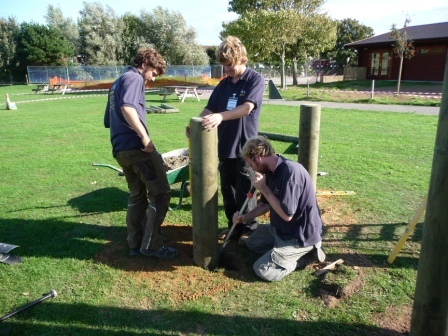 So when we looked a little deeper we found that it was possible to make a quality play ground and not break the bank in the process. 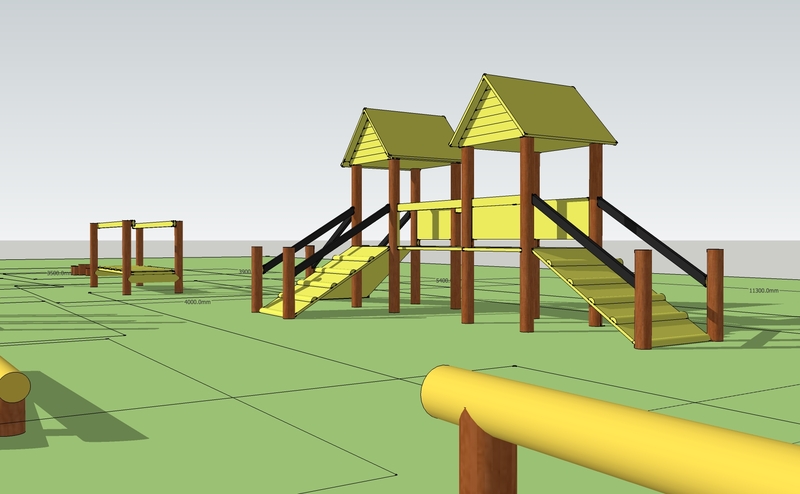 We started by creating 3D computer images of each of the chosen playground equipment and the built a virtual playground for the staff of the school to tweak so that it was unique to their requirements and location. 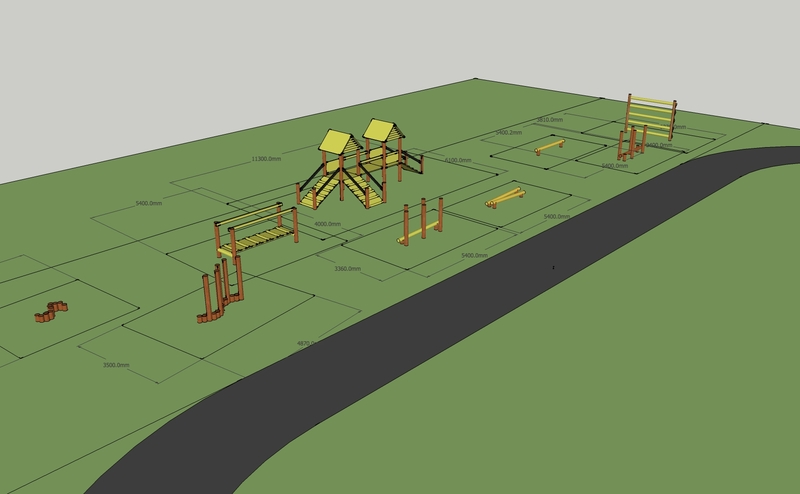 Then we applied safety distances to the model so that we could use the final plans to construct the playground from. Once we had settled on a firm plan orders were placed with our suppliers to deliver the materials and start the work. We chose a supplier who offered a 25 year guarantee on the posts and I am now convinced that we will never get a warranty problem when I saw the delivered materials! Then it was all hands to getting the positioning of the timbers correct and setting out all the pieces in the way that we had designed it. Not so easy when some of the materials were approx 45kg + and about 3M long! 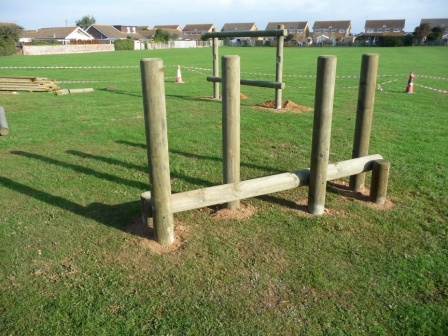 Posts being set to start construction. 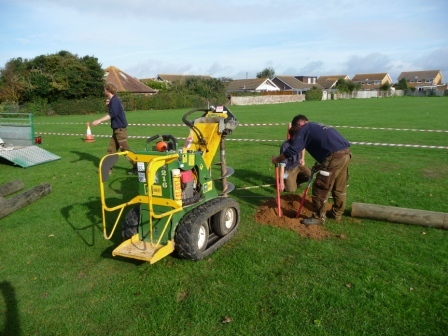 Using a post hole borer the holes are prepared in minutes, not hours. 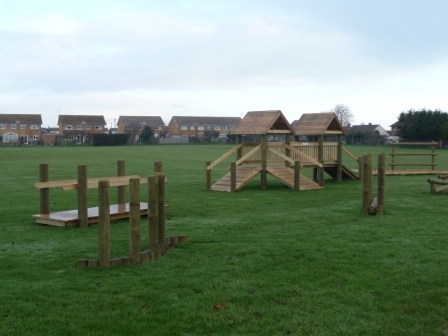 As the playground took shape the overall size of the project started to show through and we were very happy that the planning stage had ironed out many of the potential problems so that we avoided them whilst on site. It is obviously much easier to get the works done out of school time but we were conscious of the costings so with good planning this was avoided. Getting these post in line was challenging. 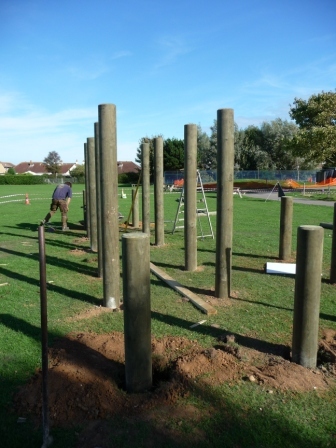 Work well underway as the new playground starts to take shape. This was the design we originally showed the school. We kept the actual construction very close to the original designs as we were very conscious of the need to be ‘fit for purpose’ and the safety aspects of the entire project. 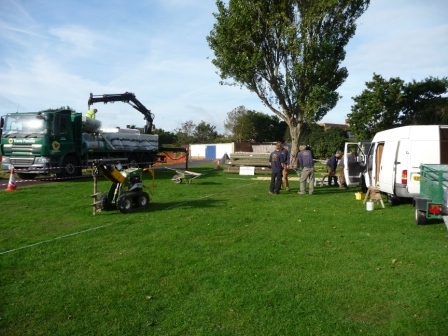 By the end of the build we were all very pl;eased with the outcome and we still managed to keep our promise… works on time, within budget, and still good value for money. 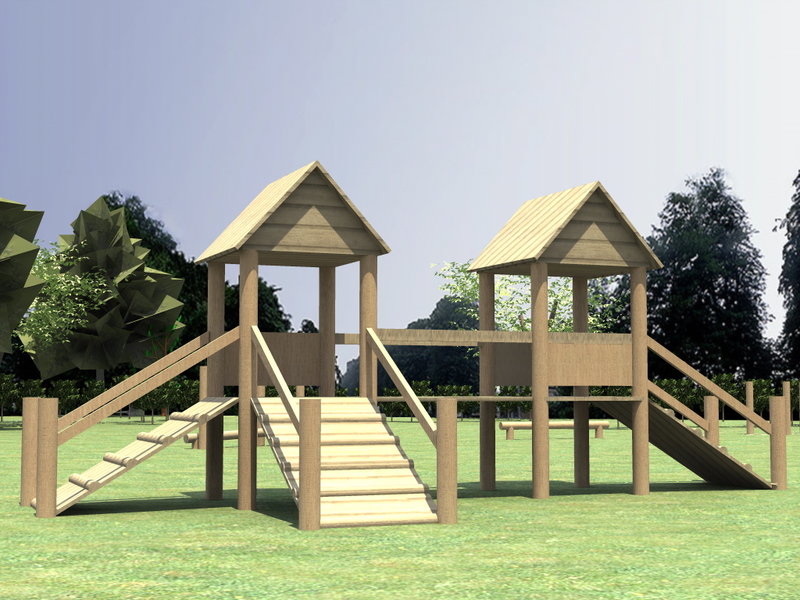 The best part will be seeing the children go mad on it at play time! !